Rams schedule contest: The team should hand over $135 trillion to anyone who guesses their schedule exactly. 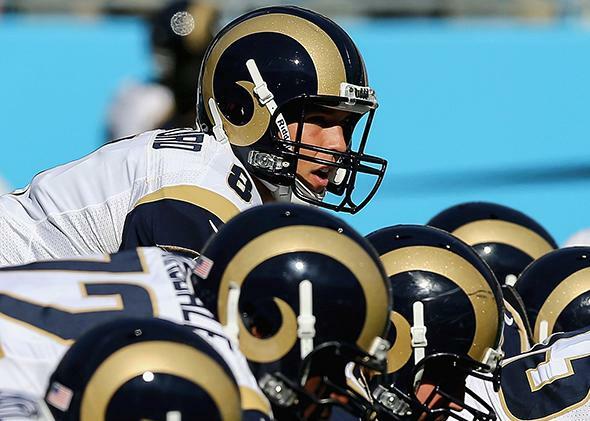 How Hard Is It to Predict the St. Louis Rams’ Schedule? So hard that the team should offer a prize of $135 trillion for getting it exactly right. Quarterback Sam Bradford of the St. Louis Rams could add $100,000 to his earnings this year by almost-impossibly correctly guessing his team’s playing schedule. The NFL’s St. Louis Rams have announced they’ll hand over $100,000 to anyone who guesses the team’s exact schedule: whom the Rams will play each week and where the game will be played; whether it’s a Sunday, Thursday, or Monday game; and when St. Louis’ bye week will fall. Each NFL team plays 16 games in the regular season, and we already know the Rams’ 16 opponents—they’re predetermined based on the division St. Louis plays in, the team’s record from the previous season, and the NFL’s annual rotations of cross-division and cross-conference opponents. We also already know which opponents St. Louis will face at home, and which it will face on the road. Given those known parameters, this guessing game couldn’t possibly be as hard as Warren Buffett’s Billion Dollar Bracket Challenge, right? Wrong. Picking the Rams’ schedule is much, much harder. If the Billion Dollar Bracket Challenge was impossible, then this is … really impossible. If you’re guessing blindly, you have a (1/2)^63 chance of picking 63 NCAA tournament games correctly—that’s roughly 1 in 9.2 quintillion. Mathematician Jeff Bergen, though, estimates the odds of constructing a perfect bracket as closer to 1 in 128 billion, since you have a much-better-than-50-50 chance of picking a bunch of specific games (such as the ones between No. 1 and No. 16 seeds). When picking a bracket, you can eliminate certain possibilities, such as a 16 beating a 1, based on probabilistic history. With the Rams’ schedule, every time you pick one game, your choices narrow. If you set St. Louis to play Seattle at home in Week 2, you know the Rams have seven home games remaining and that they will play the Seahawks just once more (in Seattle). Using this methodology, I’ve put together a list of assumptions, and the resulting odds. Most of these assumptions are flexible. They are meant to narrow the odds to a reasonable ballpark (or football stadium). If you disagree with my assumptions, or think they can be refined, let me know in the comments and I’ll update the story with your thoughts. We know the Rams play each of their three division opponents (the Cardinals, 49ers, and Seahawks) twice each. We also know they will play a divisional rival in Week 17—the final game of the season. We’ll make the additional assumption that they won’t play the same opponent in back-to-back weeks. Chance of picking the two dates on which the Rams play their second division opponent: If we ignore the assumption that you can’t play a team in back-to-back weeks, the chance is 1/(15*14) = 1/210. The first meeting can be guessed correctly 1/15 of the time and—because one more game has been knocked off the schedule—the second game can be guessed correctly 1/14 of the time. If we do make our assumption of no back-to-back games, our chance (via Monte Carlo simulation) improves to approximately 1/105. Chance of picking the two dates on which the Rams play their third division opponent: If we ignore the assumption that you can’t play a team in back-to-back weeks, the chance is 1/(13*12) = 1/156. If we do make our no-back-to-back assumption, our chance improves to approximately 1/100. Chance of picking the weeks for the remaining 10 opponents: 1/10! = 1/3,628,800. Explanation: When there are 10 weeks and 10 opponents remaining, you can think of there being a 1/10 chance of picking each week correctly. If you get that right, it’s now 1/9, and after that 1/8, etc. When multiplied together, the result is 1/10! We know the last game of the season always takes place on a Sunday. We know each team must play at least one Thursday night game, and we will assume the Rams play exactly one Thursday night game. No Monday night games are guaranteed. Last year eight teams appeared in two Monday night games, 18 appeared in one, and six never appeared. Determining the number of possible combinations for Monday night games is tricky, and depends on our assumption of the number of Monday games the Rams will play. If the Rams were to play two Monday night games, and you knew in advance that they were going to play two Monday night games, there would be (15*14)/2 = 120 possible ways to place two Monday Night Football appearances on the schedule. (This ignores the added probability of the first Monday night of the season, which features two games. It also ignores the fact that the Rams would not appear on Monday night in consecutive weeks.) The chance, then, of picking the two weeks they would have a Monday night game would be 1/120. If the Rams were to play one Monday night game, and you knew they were going to play one Monday night game, there would be 15 possible games that could be on Monday, meaning your chance of a correct guess is 1/15. And if the Rams were to play no Monday night games, and you knew they were going to play no Monday night games, you would have nothing to guess. So picking the correct combination of Rams’ Monday night games (if any) depends on how many Monday night games you think the Rams will have. We will guess that the chance of the Rams appearing in two Monday night games is 20 percent, the chance of them appearing once is 50 percent, and the chance of them appearing in no Monday night games at all is 30 percent. These guesses are based on the Rams’ poor record in recent years and relative lack of national popularity. If you assumed those chances were correct, then you’d be best served to guess that the Rams would not play a single Monday night game. In that case, you’d be right (if your assumption were right) 30 percent of the time. If you guessed they would play exactly one Monday night game, and that it was in Week 7, your chance of being correct would be much lower. The probabilities above, based on many assumptions, account for everything the Rams require to win the $100,000 (location, date, and opponent). If we multiply all those chances together, we get … 1 out of 16,294,782,089,552,200. This is about 560 times easier than picking a perfect NCAA bracket blindly, but up to 135,000 times harder than picking the perfect bracket with some skill. Yes, we could make additional assumptions to cut down the odds even more. If the Rams do play on Monday night, it’s more likely to be against a top team like the Cowboys or Seahawks than a lowly finisher like the Raiders. Some other factors, such as making sure the Rams do not play more than three games in a row at home, would limit the number of options as well. But even with some more guesswork, it’s close to impossible that anyone will predict the Rams’ 2014 schedule. So don’t insult us with that $100,000 offer, St. Louis. To make it worth anyone’s while to complete the exercise, you should pony up a lot more than $1 billion—135,000 times more. What do you say, Rams? Make things interesting and offer $135 trillion. Do that, and maybe I’ll consider giving this contest a shot.